Ever take a class and find yourself nursing a minor finger injury? I’ve seen this often, especially in older students who haven’t previously fired a lot of rounds in one day. Moleskin can help, but some people either don’t like the adhesive or can’t isolate the exact problem area. So look at what I found at the drugstore! These handy little mini-ace bandages cover your finger, provide light compression, and protect your skin from sharp bits. And they’re reuseable. 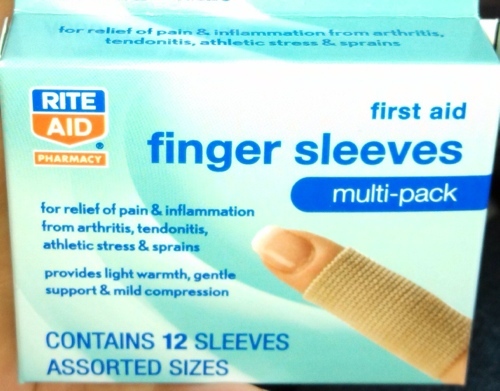 Mini ace bandages to protect sensitive fingers. Now if there was just something that would fit over the web between thumb and fingers. That’s where I get nipped. I can’t wait to wear these to a match or the range. It’ll give the rest of the crowd conversation for hours. Then again, I might have use of my right index finger afterward, so it’ll be worth it.